Nakhchivan (Azerbaijani: Naxçıvan, Armenian: Նախիջևան, Persian: نخجوان‎) is the capital of the eponymous Nakhchivan Autonomous Republic of Azerbaijan, located 450 km (280 mi) west of Baku. 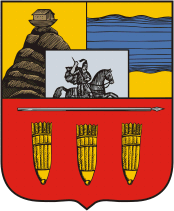 The municipality of Nakhchivan consists of the city of Nakhchivan, the settlement of Əliabad and the villages of Başbaşı, Bulqan, Haciniyyət, Qaraçuq, Qaraxanbəyli, Tumbul, Qarağalıq, and Daşduz. It is spread over the foothills of Zangezur Mountains, on the right bank of the Nakhchivan River at an altitude of 873 m (2,864 ft) above sea level. Since June 9, 2009, by the decree of the President of the Azerbaijan Republic, the Bulqan, Garachug, Garakhanbeyli, Tumbul and Haciniyyət villages of the Babek Rayon are included in the scope of the administrative territorial unit of the Nakhchivan city. Heinrich Hübschmann argued that Nakhichevan was originally named Naxcavan, which was the result of the combination of the name Naxc and avan ("town" in Armenian), thus translates to "Naxc's town", and later evolved into Nakhichevan. According to Harrison Gray Otis Dwight, Nakhichevan derives from the composition of nakh ("first" in Armenian) and ichevan ("resting-place" or "descent" in Armenian), thus translates to "first resting-place" or "first descent". Local tradition states that Nakhichevan was founded by Noah after the Flood, and was his place of death and burial. According to Saint Movses Khorenatsi, King Tigranes I of Armenia settled Median prisoners of war at Nakhichevan in the second century BC. Nakhichevan is first mentioned in Ptolemy's Geographia as Naxouana (Greek: Ναξουὰνα). Nakhichevan was destroyed by Shahanshah Shapur II in 363 and its Armenian and Jewish population was deported to Iran. Emperor Heraclius travelled through the city en route to Atropatene in 623 during the Byzantine–Sasanian War of 602–628. The Arab siege of Nakhichevan in 650 led Theodore Rshtuni to conclude a truce. After the rebellion of 703, Muhammad ibn Marwan had the rebel nobles burnt alive in churches in Nakhichevan and Goghtn in 705. Nakhichevan temporarily came under the control of the Kingdom of Armenia in c. 900, but was swiftly taken by Muhammad ibn Abi'l-Saj. The city was the temporary refuge of Atabeg Nusrat al-Din Abu Bakr after his defeat at the Battle of Shamkor in 1195, and Nakhichevan was conquered by the Kingdom of Georgia in 1197. In 1225, Nakhichevan was ruled by al-Maleka al-Jalāliya, daughter of Atabeg Muhammad Jahan Pahlavan. Genoese merchants were known to trade in the city by 1280. The city was conquered by Timur in 1401, but was taken by King George VII of Georgia in 1405. Nakhichevan was conquered by Shahanshah Ismail I in 1503. Shahanshah Abbas I of Persia reconquered Nakhichevan from the Ottoman Empire in 1603-1604. Nakhichevan was annexed to the Russian Empire per the Treaty of Turkmenchay in 1828. The city became the centre of the Nakhichevansky Uyezd in the Erivan Governorate in 1849. In 1896, Nakhichevan had a population of 7,433, roughly two-thirds of which were Azeri-speaking Muslims and one-third Armenian Christians. After the February Revolution of 1917, a soviet was formed in Nakhichevan, but the city was under the control of the Special Transcaucasian Committee from March to November 1917, and its successor the Transcaucasian Commissariat from November 1917 to March 1918. Turkey occupied Nakhichevan from June until November, after which the city was occupied by British soldiers in January 1919, and a military governor was appointed to administer Nakhichevan. It was decided that Nakhichevan would be granted to Armenia on 6 April 1919, and the city was annexed on 6 June 1919. Britain, France, Italy, and the US, with approval from Armenia and Azerbaijan, agreed on 25 October 1919 to appoint American Colonel Edmond D. Daily as General-Governor of Nakhichevan, elections would be held, and both Armenia and Azerbaijan would withdraw its forces from the territory. However, in March 1920, Turkish forces led by Kâzım Karabekir occupied Nakhichevan. Soviet Russia took control of Nakhichevan on 28 July 1920, and the city became part of the newly formed Nakhichevan Soviet Socialist Republic. The Treaty of Moscow of 16 March 1921, and later the Treaty of Kars of 21 October 1921, between Russia and Turkey agreed that Nakhichevan would be an autonomous territory under the protection of Azerbaijan and delimited its borders with Turkey. In February 1923, the city formed part of the Nakhichevan Autonomous Krai within the Azerbaijan Soviet Socialist Republic (ASSR), but later became the capital of the Nakhichevan Autonomous Soviet Socialist Republic within the ASSR in March 1924. The bishop of Mardpetakan resided at Nakhichevan, and the Armenian historian Tovma Artsruni records Sahak Vahevuni as bishop of Nakhichevan and Mardpetakan and brother of Apusahak Vahevuni. The city is spread over the foothills of Zangezur chain, on the right bank of the Nakhchivan River at an altitude of almost 1,000 m (3,300 ft). The floods and soil erosion spiked because of the decreased forest cover along riverbanks. As a result, reforestation projects implemented in the city to encourage tree planting. Nakhchivan has a continental semi-arid climate (Köppen BSk) with short but cold, snowy winters and long, dry, very hot summers. According to the State Statistics Committee of Azerbaijan, the number of population of city was 63,8 thousand in 2000. Traditionally, Nakhchivan was home to trade industry, handicraft, shoemaking and hatmaking. These industries have been largely replaced. The restoration enterprises and development industry, liberalization of foreign trade and the extension of the customs infrastructure, which has been largely responsible for Nakchivan's growth in the last two decades, are now major parts of Nakchivan's economy. The city has a wide range of cultural activities, amenities and museums. Heydar Aliyev Palace, which has a permanent local painting exhibition and a theatre hall for an audience of 1000 people, and a recently restored Soviet-time Opera Theatre where the Nakhchivan State Musical Drama Theatre realises theatre plays, concerts, musicals and opera. Many of the city's cultural sites are expected to be celebrated in 2018 when Nakhchivan was designated an Islamic Culture Capital. Momine Khatun Mausoleum is one of the most recognisable landmarks in Azerbaijan. The city is home Momine Khatun Mausoleum, Gulustan Mausoleum, Noah's Mausoleum, Garabaghlar Mausoleum, Yusif ibn Kuseyir Mausoleum, Imamzadeh mausoleum and Mausoleum of Huseyn Javid mausoleums. The main sight in the city is the heavily restored 12th-century Momine Khatun Mausoleum, also known as Atabek Gumbezi. Momine Khatun was the wife of Eldegizid Atabek Jahan Pahlivan, ruler of the Atabek Eldegiz emirate. The 10-sided monument is decorated with intricate geometrical motives and Kufic script, it uses turquoise glazed bricks. It shares the neighbourhood with a statue of its architect - Ajami Nakhchivani - and a bust of Heydar Aliyev. Also from the 12th century and by the same architect, is the octagonal Yusuf Ibn Kuseir tomb, known as Atababa, half abandoned near the main cemetery. In 1993, the white marble mausoleum of Hussein Javid was built. The Azerbaijani writer died in the Gulag during Joseph Stalin's Great Purge. Both the mausoleum and his house museum are located east of the theatre. Although being a recent construction, Huseyn Javid's mausoleum is of great iconic importance, representing the ability of the exclave to live despite the Armenian embargo and becoming a symbol of Nakhchivan itself. The mausoleums of Nakhichevan were entered for possible inclusion in the List of World Heritage Sites, UNESCO in 1998 by Gulnara Mehmandarova — president of Azerbaijan Committee of ICOMOS—International Council on Monuments and Sites. Lavash is made with flour, water, and salt. The thickness of the bread varies depending on how thin it was rolled out. Toasted sesame seeds and/or poppy seeds are sometimes sprinkled on before baking. It is impossible to imagine any table without bread in Azerbaijan and also in Nakhchivan. In connection with this, the assortment of bread in Nakhchivan is different; the tendir lavash as thin as paper, galin (thick), dastana, and komba(ash cake). If prepared to saj it was called lavash, “Juha salmag” – spread Juha, lavash bread on saj, and if prepared in the tandir, the “llavash yapmag” lavash bread stick. The fact is that it was necessary to stick lavash bread on the hot inner walls of the tandir. it is impossible to fight with lavash bread, as the proverb reads “Gyaldi lavash – Bitdili Savas” – “Came lavash – the end of the war.” There are many people’s ideological expressions about lavash “Yavash-yavash -pendir- lavash ” “Quietly (slow) – cheese lavash ” or ” Khamrali hash – bagryna bass”, “Khamraliev (kind of bread) push to the chest, i.e. . lavash bread – eat slowly. “Of lavash folk sandwiches are made in a roll shape – durmek. In the village where children ran out to play or school they were supplied with these sandwiches. Inside durmeks – rolls was put butter and jam, cheese, cottage cheese and butter, cheese with herbs, potatoes, boiled eggs, etc. Ashabi-Kahf is a sanctuary in a natural cave which is located in the eastern part of the city of Nakhchivan, between the mountains of Ilandag and Nahajir in Azerbaijan.Since ancient times Ashabi-Kahf is considered as a sacred place.It is known not only in Nakhchivan, but also in other regions of Azerbaijan and countries of the Middle East.Each year ten thousands of people make a pilgrimage to this place. The city also has many historical museums, the literature museum of Nakhchivan Autonomous Republic, Nakhchivan State History Museum, The Nakhchivan State Carpet Museum, and the house museums of Jamshid Nakhchivanski and Bahruz Kangarli. There is also an archaeological museum found on Istiqlal street. The city has a few interesting mosques, particularly the Juma mosque, with its large dome. Modern museums in Nakchivan include the Museum under Open Air, Heydar Aliyev Museum and the Memorial Museum (Xatıra Muzeyi), dedicated to the national strife between Armenia and Azerbaijan. The regional channels Naxçıvan TV and Kanal 35, and newspaper Sharg Gapisi are headquartered in the city. Araz Naxçivan one of the top futsal clubs in the European futsal arena and regularly participates in UEFA Futsal Cup. Nakhchivan had one professional football team, Araz-Naxçıvan, which competed in the top-flight of Azerbaijani football, the Azerbaijan Premier League. In 2014, the city hosted Masters Weightlifting World Cup. There are 3 professional, 6 musical, 22 secondary schools and a military cadet school in Nakchivan administered by the city council. Nakhchivan's trolleybus system consisted of three lines at its height and existed until 2004. Nakhchivan Airport is the only commercial airport serving Nakhchivan. The airport is connected by bus to the city center. There are domestic flights to Baku and international service to Russia and Turkey. In 2007, a new bridge across the Aras River to Iran opened and a Turkish rail line connected Nakhchivan indirectly to Baku in 2013. Currently, light rail line is working from Nakchivan to Ordubad beyond to Sharur. Some of the city's many prestigious residents include: president of Azerbaijan Heydar Aliyev, Huseyn Javid — poet and playwright, founder of the progressive romanticism in Azerbaijani literature, writer Jalil Mammadguluzadeh, opera singer Azer Zeynalov, film director Rza Tahmasib, generals Huseyn Khan Nakhchivanski and Jamshid Nakhchivanski, artist Bahruz Kangarli and architect Ajami Nakhchivani. Heydar Aliyev, was the longest serving political leader in Azerbaijan. Huseyn Javid, was the founder of the progressive romanticism in Azerbaijani literature. Jalil Mammadguluzadeh, was an Azerbaijani satirist and writer. Abdurrahman Fatalibeyli, was a Soviet army major who defected to the German forces during World War II. Jamshid Nakhchivanski, was a Russian Imperial, Azerbaijani and Soviet military commander. Bahruz Kangarli, the founder of realistic easel painting of Azerbaijan. Rza Tahmasib, film director and actor. Huseyn Khan Nakhchivanski, was the only Muslim to serve as General-Adjutant of the Russian Emperor. Ali M. Hasanov, serves as the National Adviser to the President of Azerbaijan. Nakhchivan is twinned with various cities. ^ "Belediyye Informasiya Sistemi" (in Azerbaijani). Archived from the original on 24 September 2008. ^ "Milli Məclis". www.meclis.gov.az. Retrieved 2 April 2018. ^ a b c Hay, Mark. "How Environmentalism Can Foster Nation-Building". magazine.good.is. Retrieved 13 November 2014. ^ "Naxcivan Climate Normals 1961–1990". National Oceanic and Atmospheric Administration. Retrieved 22 March 2015. ^ "Political division, population size and structure: Population by towns and regions of the Republic of Azerbaijan". ^ "Нахичеванская ССР 1926". www.ethno-kavkaz.narod.ru. Retrieved 22 October 2018. ^ "население азербайджана". www.ethno-kavkaz.narod.ru. Retrieved 22 October 2018. ^ "Русские и украинцы в Азербайджане 1939". www.ethno-kavkaz.narod.ru. Retrieved 22 October 2018. ^ "NAXÇIVAN MUXTAR RESPUBLİKASI - rəsmi portal". nakhchivan.az. ^ "Ilham Aliyev attended a ceremony to commemorate the 90th anniversary of the Nakhchivan Autonomous Republic". en.president.az. Retrieved 13 November 2014. ^ "Nakhchivan to be capital of Islamic Culture in 2018". en.apa.az. Retrieved 13 November 2014. ^ "The mausoleum of Nakhichevan". whc.unesco.org. UNESCO. Retrieved 13 November 2014. ^ UNESCO World Heritage Centre. "The mausoleum of Nakhichevan (#)". unesco.org. ^ Peart, Ian. "Land of Legend - Nakhchivan". www.visions.az. Retrieved 13 November 2014. ^ "Happy Friday night for Benfica, Puntar and Araz". uefa.com. Retrieved 2 April 2018. ^ "Club's uefa.com profile". uefa.com. Retrieved 2 April 2018. ^ В Нахчыване появится футбольный клуб Араз. Azerifootball.com (in Russian). Retrieved 23 May 2013. ^ "Masters World Cup 2014". nakhchivan2014.com. Retrieved 13 November 2014. ^ "Naxçıvan Muxtar Respublikası". nakhchivan.az. ^ "15. Нахичевань (троллейбус)" [15. Nahičevan (trolleybus)]. Горэлектротранс (Electrotrans) website (in Russian). Дмитрий Зиновьев (Dmitry Zinoviev). Retrieved 26 September 2012. ^ Алиев Гейдар Али Рза оглы (in Russian). Справочник по истории Коммунистической партии и Советского Союза 1898 - 1991. ^ "Batumi - Twin Towns & Sister Cities". Batumi City Hall. Archived from the original on 4 May 2012. Retrieved 10 August 2013. Bernardini, Michele (2000). "GENOA". Encyclopaedia Iranica. Blankinship, Khalid Yahya (1994). The End of the Jihad State: The Reign of Hisham Ibn 'Abd al-Malik and the Collapse of the Umayyads. State University of New York Press. Bosworth, C. Edmund (2013). "NAḴJAVĀN". Encyclopaedia Iranica. Chaumont, M. L. (1986). "ARMENIA AND IRAN ii. The pre-Islamic period". Encyclopaedia Iranica. Hille, Charlotte Mathilde Louise (2010). State Building and Conflict Resolution in the Caucasus. BRILL. Lanser, Richard D. (2007). An Armenian Perspective on the Search for Noah’s Ark (PDF). Associates for Biblical Research. Lint, Theo van (2018). "Nakhchivan". The Oxford Dictionary of Late Antiquity, ed. Oliver Nicholson. Oxford University Press. Rayfield, Donald (2013). Edge of Empires: A History of Georgia. Reaktion Books. Thomas, David; Mallett, Alexander; Roggema, Barbara (2010). Christian-Muslim Relations. A Bibliographical History. Volume 2 (900-1050). BRILL. Wikimedia Commons has media related to Nakhchivan city. This page was last edited on 1 April 2019, at 06:44 (UTC).